Using our most advanced techniques and instruments we sift through study the cosmic microwave background as a relic of the early universe to understand the events surrounding the birth and subsequent development of the Universe. 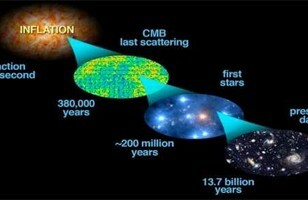 A precision inspection and investigation of the CMB and other observations along with careful analysis, discussion, and computer modeling have allowed us determine what happened over billions of years with amazing certainty and accuracy. Some of the findings are surprising. A continuing mapping of the large-scale structure allows us to check this in detail and gives us the concepts for even more ways to map the history of the Universe. While things are so far consistent, there remain even more mysteries to be solved. In spite of that we can tell the tale of the creation and history of the Universe and show key supporting evidence some of it from very early times including using the cosmic background light to provide a direct image of the embryo universe. This talk reviews of the current state of cosmological observations based on observations and the challenging issues still to be confronted.